November 10, 1895: The Arthur Manor Sunday School Association is organized to provide religious instruction for the children in Arthur Manor in the Town of Scarsdale. It meets on Sunday afternoons on the second floor of a fire engine house on Sprague Road (pictured to the right). Summer, 1896: The Sunday School Association forms a Devotional Committee, which arranges for preaching services to be held during the summer. Summer, 1897: Twenty younger members of the Arthur Manor Sunday School Association form the Christian Endeavor Society and begin publishing a four-page news sheet titled The Scarsdale Inquirer. After several years of being a Sunday School publication, it changes hands a number of times but continues to this day as a vital community newspaper. March 26, 1901: The White Plains Congregational Church is organized. Six months later it calls as its first pastor William Dana Street (who, four years earlier, while still a student at Union Theological Seminary, had conducted summer services for adults at the Sunday School in Scarsdale). The congregation meets in a carpenter shop on Tibbitts Avenue in White Plains until construction of its church building on Ridgeview Avenue is completed in December. November 1901: In response to growing demand from Scarsdale congregants, Rev. Street conducts monthly services throughout the winter at the fire engine house in Scarsdale. October 1902: Arthur Osborn Pritchard, a student at Union Theological Seminary, is hired to preach at the fire engine house during the winter. Upon graduation in 1903, he will be called as Assistant Pastor of the White Plains Congregational Church and put in charge of all work in Scarsdale. April 1, 1903: The Scarsdale Congregation is organized as a branch of the White Plains Congregational Church, under the guidance of Arthur Osborn Pritchard. There are 30 members. May 25, 1904: A new constitution changes the name of the White Plains Congregational Church to the Westchester Congregational Church and provides for the White Plains and Scarsdale Churches to have equal powers and privileges. 1904: The Scarsdale Estates, a land company with extensive holdings in White Plains and Scarsdale (whose president, James Cannon is a prominent member of the Westchester Congregational Church and a resident of Scarsdale), donates a half-acre plot of land at the corner of Heathcote and Post Roads to the Scarsdale Congregation. Another member of the Westchester Congregational Church, William S. Phillips, donates his services as supervising architect for a church building to be constructed of field stone in the style of a small English chapel. Funds are raised from a wide spectrum of local denominations, including Roman Catholics. 1906: Membership in the Church totals 75 people. 1908: The congregation purchases a plot of land of about three-quarters of an acre immediately adjoining the initial church plot for the purpose of building a parsonage. 1912: Following the death of her husband in 1911, Mrs. Theodore Storrs Lee returns to India to continue as representative of the church in its missionary work. 1916: Membership in the church totals 177 people, an increase of 100 in ten years. September 25, 1918: Rev. Henry MacPherson Dyckman arrives from Westfield, Massachusetts. By this time the Little Stone Church (pictured to the right, in 1911) is too small for the congregation. The attendance in Sunday School alone has increased to about a hundred. A new building project is envisioned: an assembly hall and a separate sanctuary. 1921: Membership in the Church has risen to 307 people. The need for a larger space has become urgent. But as the funds in sight were insufficient to permit the completion of the entire building program, the question was, which to build first? On the principle that a church should endeavor to serve its community, the congregation voted to construct an assembly hall first and a sanctuary second. October 19, 1922: The Assembly Hall (pictured to the left) is completed. The Reverend Harry Emerson Fosdick takes part in the dedicatory service. 1923: John W. Dickinson gives $50,000 to establish a trust fund to be used solely for the construction of a building in which there would be a sanctuary. August 26, 1923: Rev. Dyckman dies. September 23, 1923: The Assembly Hall is named Dyckman Hall in memory of Rev. Henry MacPherson Dyckman. January 6, 1924: Rev. Theodore M. Shipherd begins his pastorate. May 11, 1924: The congregation votes to become an independent church. October 22, 1924: The Scarsdale Congregation is formed into a separate church (no longer a branch of Westchester Congregational Church) and a Constitution and By-laws are adopted. January 1, 1930: The active membership of the Church is 428; enrollment in the Church School is 400. Average attendance at worship is 200. 1931: Having obtained a $30,000 subscription and a $35,000 mortgage, the Church purchases 5.76 acres at the intersection of Sherbrooke and Heathcote Roads for the purpose of building a sanctuary. 1932: An architect is appointed to prepare plans for a building on the new site large enough to seat 600 at a cost not to exceed $125,000. Plans are halted by the Depression. 1938: With funds severely limited by difficult economic times, the Church receives an extension on the 1931 mortgage by agreeing to make a serious effort to sell the property. 1941: Eleven members of the Church join together to purchase the property that had been acquired in 1931. The price: $11,750 (down from $65,000). 1941: The Scarsdale Congregational Church Guild is organized. Its first president is Charlotte Boynton. 1941-1945: 153 members of the Church serve in World War II. Six are killed. 1946: The consortium of eleven members sells the Sherbrooke Road property. November 4, 1947: The Church holds its first “Bazaar Day” (later named the “All-Church Fair”) on Election Day, when everyone is off work and out of school. The Bazaar nets $3,700, which goes into the fund for the new sanctuary. March 25, 1951: The first service is held in the new Sanctuary. 924 people attend the two services (beyond the capacity of the church). 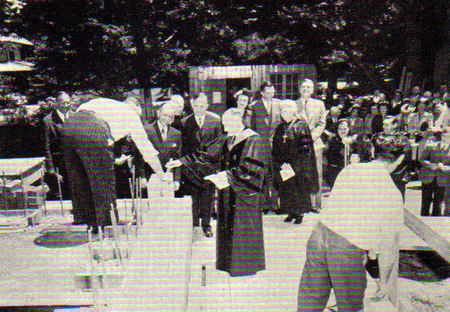 April 1, 1951: The Sanctuary is dedicated. 404 people attend the dedication. The active membership of the Church is recorded as 624. 1952: Claire v.g. Thomas is hired as Organist and Choir Director. In 1956, Ms. Thomas will become the church’s first Minister of Music. She oversees four choirs and serves for 20 years. November 12, 1951: The Church By-Laws are amended to provide for a coordinating Church Council of 17 members (replacing the Board of Officers, which had been established in 1924). The number of deacons is increased from 9 to 18 (to be divided evenly between men and women). The title of the chief lay officer is changed from Chairman (there had been 14 Chairmen between 1924 and 1952) to Moderator. 1952: The first person to hold the title of Moderator is Carleton Everett, whose son Bob would become Moderator 46 years later. 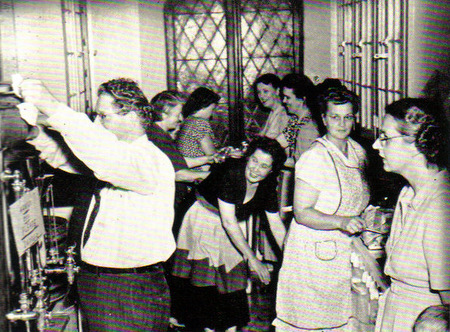 1952: The Church authorizes the remodeling of Dyckman Hall into the Parish House. The last public event in the old Dyckman Hall is a concert on April 23, 1954. 1951-1955: Active membership in the Church increases over these four years from 586 to 1,180; enrollment in the Church School grows from 235 to 562; attendance at Sunday morning worship grows from 167 to 554. April 17, 1955: The new Parish House is dedicated. September 1958: With the sponsorship of the SCC Board of Christian Education, the Scarsdale Congregational Church Nursery School is founded and begins holding weekday sessions for 20 children, ages three and four (a class for two-year-olds will be added in 1989). The Nursery School, a not-for-profit enterprise directed by Mrs. Emlyn Elias, is immediately successful. 1961: The Scarsdale Congregational Church becomes a member of the United Church of Christ. 1962: Church membership is 1,281. Average Sunday worship attendance is 506. 1969: Church membership is 962. Average Sunday worship attendance is 310. 1972: Dr. John Frederick Schuder is hired and is soon accorded the title Minister of Music (the second person to hold that title). Dr. Schuder serves for the next 34 years. Fall, 1974: A new organ (our current instrument) is installed. The old organ had failed the previous Christmas, and the choir had continued a cappella for several months. During lean economic times, a capital drive headed by Janice and Lou Pingel collected $90,000 to pay for the new organ. 1981: Women Unlimited is formed (based on an idea of Lois Seulowitz). The group, an informal monthly forum, plans meetings ranging from home potlucks to weekend retreats. December 1981: The manse at 16 Drake Avenue is sold; the proceeds are used to create the "M Fund," the earnings of which provide for ministers' compensation. 1982: The Outreach Committee establishes The Hunger Task Force. The first project, focusing on East Harlem and named Project Resurrection for Resurrection House on East 129th St. in Manhattan, involves cooking and serving a hot meal for 130 persons each Saturday. July 1, 1983: Phillip S. Washburn begins his 24 years of ministry at the Church. Summer, 1984: After years of rotating summer services among local churches, the Church (along with other Scarsdale churches) resumes having services every Sunday during the summer. December 24, 1984: The first "do-it-yourself pageant" is staged at the Christmas Eve Family Service. July 1985: Following two years of planning, the Chancel Choir joins the senior choir of St. James the Less on a two-week singing tour of England and Scotland. The combined chorus of 33 members and an accompanying group of 25, all organized by Patricia Lilly, were led by Robert Roth of St. James the Less and John Schuder. 1987: The first computer is installed in the Church office. April 17, 1990: The General Board accepts Personnel Policies drafted by the newly-formed Personnel Policies Committee. 1992: The Church begins using Hymns, Psalms and Spiritual Songs as our hymnal. 1997: Two significant rooms are created in the lower floor of the Sanctuary, thanks to generous member donations. Ruth and Barbara Mackey donate the funds to create a rehearsal room for the Chancel Choir. Connie Farnham donates the funds for a closed-circuit television and furnishings in the Archibald Room, to allow parents with wiggly toddlers to experience the worship service. January 1997: The first open-mike talent show is held. The event, familiarly known as "Fruitcake Night," is an opportunity to share leftover Christmas desserts and to enjoy a multi-generational performance by talents in the congregation. Fall 1998: The Church School, with the assistance of the Christian Children's Fund, begins supporting Abdoulie, a disabled boy living in the Gambia. Fall 1998: The renovated Austin pipe organ is dedicated. 1999: The Church begins discussions on becoming an Open and Affirming Church. May 7, 1999:The website is inaugurated. 2001: The Special Gifts Foundation, the "M Fund," the Elizabeth Carret Fund and the Philip Carret Fund are combined into the Commemorative Endowment Fund to facilitate oversight of endowment monies. February 11, 2001: With a performance of Durufle's Requiem, John Schuder and the Chancel Choir bring to a close 25 years of Music Series concerts. September 16, 2001: 227 gather in the Sanctuary for a special service following the attacks of September 11. Spring 2004: The Church embarks on a "Renaissance Project" to explore areas of interest for the future. The process of small-group discussions reveals desires for expanded children's music, membership growth, cultivation of youth activities, educational programs for adults and concomitant support for senior activities. Fall 2004: Associate Minister Frances Wise Grenley organizes the Youth Action Committee. May 7, 2006: The Church votes to become "An Open and Affirming Church -- Warmly Welcoming All of God's Children." June 4, 2006: The Phillip and Nancy Washburn Memory Garden is dedicated. December 31, 2006: After 34 years as Minister of Music, John Schuder retires. April 2007: Members of the Youth Action Committee make their first week-long visit to the Oglala Lakota Reservation in Pine Ridge, South Dakota. June 3, 2007: Phil Washburn preaches his last sermon after 24 years as Senior Minister. September 9, 2007: After a summer of extensive refurbishing, the Sanctuary is re-dedicated. July 1, 2009: Rev. Dr. Larry Kalajainen begins his pastorate at the Church. August 1, 2010: Brett A. Terry begins his tenure as Music Director and Organist. Mr. Terry departs this position five years later to move out of state. June 17, 2013: Rev. Larry Kalajainen holds his final service at the Church, leaving to become pastor of a Methodist church in New Jersey. July 1, 2013: Reverend Frances Wise Grenley becomes the first woman in the church’s history to hold the position of Senior Minister. September 2015: The Church begins its church school year with two new staff members, Sandro Russo as Music Director and Organist and Daniel Shlorff as Director of Christian Education and Ministerial Assistant. November 18. 2017: Joya Colon-Berezin is ordained as a United Church of Christ Minister of Word and Sacrament.